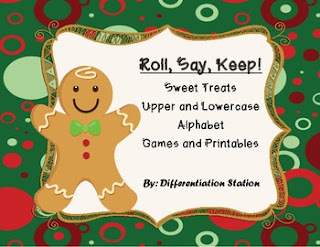 This is a winter holiday themed center, game and printables. You can use it for Christmas, or just for fun! This is a game that can be used in a center or small group setting. It is appropriate for advanced preschoolers, kindergarten, special education instruction, RtI, or for any student that needs extra practice in learning their upper and lowercase letters. It is great for adding active learning while practicing basic skills! There is a lot of repetition to help students strengthen their knowledge of the upper and lowercase letters of the alphabet. You can use this game to focus on letter names, or to focus on the sound that each letter makes. There are printables for every upper and lowercase letter of the alphabet. Students will use these extension worksheets to practice identifying the specific upper or lowercase letters that you are focusing on in your lessons. -Print and laminate Roll, Say, Keep mats and alphabet cards for durability. Print as many mats as you need for the students that will play. -This can be done in a center or small group setting. -Students will place the alphabet cards facedown, in a pile, on the table. Students will choose 6 cards and place them on each square of their “Roll, Say, Keep” mat. -Students will roll the die and identify the number of dots on the die. They will match it to the same number on their mat. -The student will read the letter. If they are able to correctly identify the letter, they pick up the card and put it in their pile in front of their board. They “won” this card. If they are not able to identify the letter, they leave it on their board to try again. -Students will continue until all the cards are gone. The student with the most alphabet cards wins. -You can choose to work with only upper or lowercase letters, or to combine all the letters. You can work on letter identification, or to work on naming the letter sounds. -Students will complete extension activities, after playing the game. There are two extension activities. In the first, students will distinguish between specific letters. They will color or use bingo markers to identify a specific letter. They will only dot the specific letter. There is a worksheet for every upper and lowercase letter of the alphabet, so that you can use only what you need. -In the second, they will distinguish between upper and lowercase letters. For example, they will color or dot the uppercase “A” orange and the lowercase “a” green. There is a worksheet for every letter of the alphabet. If you loved "Holiday Sweet Treats! "Roll, Say, Keep!" Alphabet Game, Center, Printables", you need to take a look at these games and activities!